Helen Layfield Bradley - Sunshine & Shadows across the Leven Estuary, Lake District, 1965 - Online gallery supplying original fine art. Trending Modern British and Contemporary Welsh. Available for sale from Big Sky Fine Art; this original oil painting by Helen Layfield Bradley, dating from 1965.<br> The painted surface has benefitted from cleaning and conservation, which took place in 2009 on our instructions. The painting is presented and supplied in a sympathetic contemporary frame. <br> <br> Helen Layfield Bradley showed early signs of artistic talent but this was put on hold first for the war and then whilst she brought up her family. Indeed, she did not begin to produce paintings until she was 65 and then did so as a way of showing her granddaughter what life was like when she herself was a child. During the following decade she attained international celebrity and recognition as an artist. In 1979 she was awarded the MBE for services to art, but died shortly before she was due to receive the honour from the Queen. <br> <br> Mrs Bradley had three exhibitions at the Mercury Gallery in London and one in Los Angeles and was much loved both sides of the Atlantic.<br> Her paintings typically depict scenes from Edwardian Lancashire with groups of figures, including her family and friends. A familiar figure in many of her paintings was a neighbour, Miss Carter, who wore pink. She gave her name to the first and most famous of four books of her works “And Miss Carter Wore Pink”. Her works are typically signed with a small black fly, as this one is.<br> <br> Like L.S. Lowry, who was an associate and friend, Mrs Bradley’s figurative works are generally described as “naïve” or primitive”. However, whilst they both painted many industrial backgrounds Mrs Bradley’s scenes showed people who are well dressed, colourful and happy. Her country scenes depicting figures are idyllic and her rarer landscape scenes show a dreamlike quality and stunning use of colour and light. This is such a picture and shows a house where she had stayed, near to her home on the edge of the Lake District. 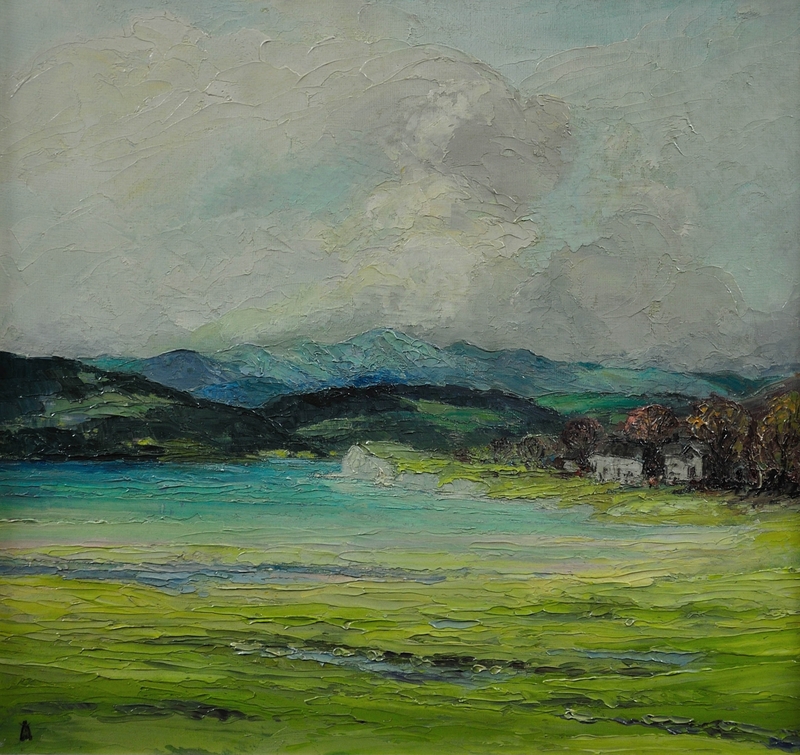 The painting was originally painted as a gift to her hosts.<br> <br> The landscape scene depicted is of the estuary of the River Leven in the Lake District, Cumbria, as seen from Lancashire. 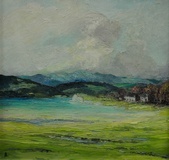 There are cottages nestling under blue fell mountains and a cloudy sky.<br> The technique used here is impasto, where paint is laid on the surface very thickly. Available for sale from Big Sky Fine Art; this original oil painting by Helen Layfield Bradley, dating from 1965. The painted surface has benefitted from cleaning and conservation, which took place in 2009 on our instructions. The painting is presented and supplied in a sympathetic contemporary frame. Helen Layfield Bradley showed early signs of artistic talent but this was put on hold first for the war and then whilst she brought up her family. Indeed, she did not begin to produce paintings until she was 65 and then did so as a way of showing her granddaughter what life was like when she herself was a child. During the following decade she attained international celebrity and recognition as an artist. In 1979 she was awarded the MBE for services to art, but died shortly before she was due to receive the honour from the Queen. Mrs Bradley had three exhibitions at the Mercury Gallery in London and one in Los Angeles and was much loved both sides of the Atlantic. Her paintings typically depict scenes from Edwardian Lancashire with groups of figures, including her family and friends. A familiar figure in many of her paintings was a neighbour, Miss Carter, who wore pink. She gave her name to the first and most famous of four books of her works “And Miss Carter Wore Pink”. Her works are typically signed with a small black fly, as this one is. Like L.S. Lowry, who was an associate and friend, Mrs Bradley’s figurative works are generally described as “naïve” or primitive”. However, whilst they both painted many industrial backgrounds Mrs Bradley’s scenes showed people who are well dressed, colourful and happy. Her country scenes depicting figures are idyllic and her rarer landscape scenes show a dreamlike quality and stunning use of colour and light. This is such a picture and shows a house where she had stayed, near to her home on the edge of the Lake District. The painting was originally painted as a gift to her hosts. The landscape scene depicted is of the estuary of the River Leven in the Lake District, Cumbria, as seen from Lancashire. There are cottages nestling under blue fell mountains and a cloudy sky. The technique used here is impasto, where paint is laid on the surface very thickly.